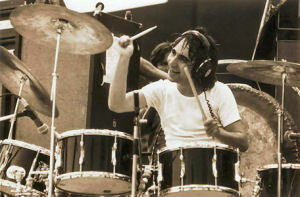 Keith Moon would have been 62, and fast approaching his second bus pass, on August 23rd 2008. I first met him sometime in the summer of 1965. He was coming out of an independent studio in London called IBC as I was going in. The Who had just been making a record and I was doing some session work for a band called Unit 4 + 2. We said hello and that was it. It would be easy for me to say this was the legendary session where Moonie arrived to find that the record company had sent along another drummer to record with the band in his place, but it probably wouldn”t be the truth. Anyway whenever it was that that particular other drummer was booked, he was quickly dispatched and the Who got on with their recording. From then on our paths crossed frequently at clubs like the `Cromwellian”, the `Bag o” Nails”, the `Speakeasy”, the `Scotch At St. James” or the `Revolution”. Here he, and sometimes I, would get up at the drop of a hat and sit in with whichever band was playing. The interesting thing to me is that he played more or less the same thing to every song! A bass playing friend of mine, who wishes to remain anonymous, recalls Moonie sitting in with his band at the `Bag” and playing `Walking the Dog” as if it were `My Generation”! Moonie admitted to me once that he couldn”t play slow music. He was desperate to play songs like `When A Man Loves A Woman” or `My Girl” but he simply couldn”t. I”ve always thought it was his unique style which wouldn”t let him. Having said that, his style, like Ginger Baker”s, Ringo Starr”s, Charlie Watts’ and John Bonham”s contributed totally to, and even defined the sound of their bands. It actually dictated the feel of the music that they played. 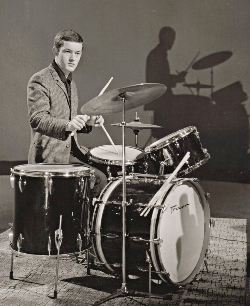 Besides playing at the same time on mid-sixties TV shows like ”Ready Steady Go”, `Thank Your Lucky Stars” and eventually `Top Of The Pops” where we all mimed, (something Moonie did badly and without shame) we did some real gigs together when the Roulettes, a group I was in at that time, supported the Who. I was surprised to discover that at that time in ”67, even though he had two bass drums, he only had a bass pedal on the right hand one. The left one was simply to support the toms over on the hi-hat side (Jon Hiseman admitted to me once that the bass on his left was also something of a prop – mind you he”s got a double pedal on his main bass drum). 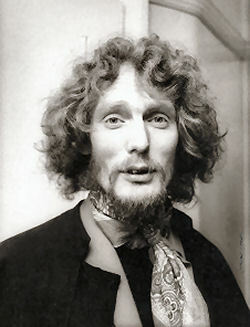 I realise Moonie did use two basses because you can hear them thundering on record, and Ginger Baker told me he beat him to the punch on this. But at that time he had just a single pedal. I also discovered that as far as Pete Townsend”s instrument wrecking was concerned the Marshall cabinets he attacked so vigorously with his guitar were empty and had easily replaceable sacking across their fronts. Furthermore, one of the roadies supported the empty cabinets from behind to stop them from toppling over! I vividly remember my next band, Argent doing a gig in Rotterdam with The Who and The Eagles where Moonie invited me into their dressing room for a drink. He got my bottle of Remy out of a full crate which was stashed behind his chair. “Dear boy”, he said, “this is for you, the rest are for me”. He”d just switched over from drinking a bottle of whisky a day because his Doctor had advised him that he would live just a little longer if he drank brandy instead. 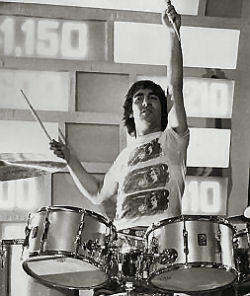 At that time he was using a Gretsch walnut snare drum called a DRB Special with his massive Premier kit. He had several of them which were custom-built in New York. He offered me one with my brandy, but I was too polite to take it. I regret the rash action now, because I really would have liked to have some tangible memento of him. On the plane home the Who were all sitting in front of us Argents. Moonie was reasonably well-behaved and from time to time would stagger back to us to force more alcohol into me and when we left the plane a very straight British Airways stewardess asked if I was Mr Henrit. She had her hand behind her back and when I owned up, brought out a black and red lace corset complete with suspenders which that nice Mr Moon had left for me. God knows where he got it, why he had it or how he persuaded the lady to give it to me. He was very good at getting people to do things was Keith. If he was playing a prank on you he”d work at it until you laughed. He wouldn”t care how long it took or what he had to do to accomplish it. I once spoke to Bob Zildjian about Keith and his antics but he was un-impressed – “Moonie didn’t invent creative misbehaviour, musicians have been doing that sort of thing for fifty years”, he said. He went on to tell me a story about a jazz violinist during the hey day of Vaudeville in America, which is too rude for publication here, but involves a singing cowboy, a violin bow and his easily excitable horse (who was possibly called Trigger)! Moonie may, or may not have had anything to do with exciting horses, but he certainly knew a thing or too about throwing televisions out of hotel windows. Mind you, it wasn”t simply a question of unplugging it opening the window and letting it go. No, he sent out for extra lengths of mains lead and aerial co-axial so the set would actually be working on its way down to oblivion! Perhaps of all the Moonie plane stories, my favourite involves a can of Campbell”s vegetable soup. Moonie would stagger on to a plane in front of everybody else complaining of a hangover, and, while no-one was looking would tip an already opened tin of vegetable soup into his sickbag and replace it surreptitiously in the seatback in front of him. As the flight went on Keith would begin to make loud moaning noises and complain of air-sickness. Eventually he”d grab the sickbag and pretend to be violently sick into it. As the other First-class passengers and stewardesses around him began to be genuinely concerned for his health, he”d sit back, slowly tip up the bag and swallow the Campbell”s soup with a wicked grin on his face. By this time glamorous film stars, Duchesses and the like would be fainting with shock. Moonie would simply order himself another drink to take the taste of the cold soup away! There is another ”plane story which I”m not so keen on since it has an element of danger in it for all the passengers but I’ll tell it anyway. 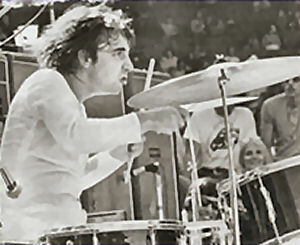 Moonie burst into the cockpit on a trans-Atlantic flight with his drumsticks and proceeded to play rudiments all over the instruments and controls. Not surprisingly the pilot was not particularly pleased by this behaviour and proceeded to drop Keith off at the very next available airport – which happened to be in the Bahamas. This expensive unscheduled stop found its way into all the national papers although not the reason for it, and he spilled the beans when he finally arrived back in England a few grand poorer. It”s to his eternal credit, that he never let the truth get in the way of a good story. 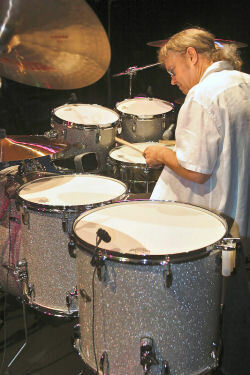 I played one of Keith”s kits once when I was making Roger Daltrey”s solo album in the spring of 1973. The recording was done in a barn next to Roger”s house in Sussex and it just happened to be equipped with one of his Premier kits. 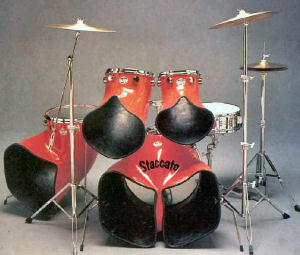 It was red and equipped with a pair of those odd sized, double-headed toms mounted on the bass drum. Up until then I”d only had a single mounted tom although I had two different sized bass drums and a couple of floor toms. Having two top toms was real turn-on for me, I couldn”t leave them alone. Since then I wouldn”t be seen dead without a pair of rack toms, although I admire the discipline of scintillating with just a single tom like Clem Burke, Neil Conti and Jim Keltner did. 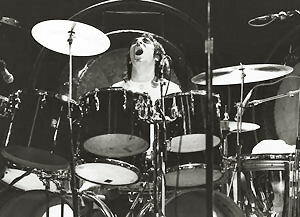 I don”t believe Keith Moon would have been at his best behind a small drum kit. Of course he played one from time to time, but this approach to drums was more of a global thing. He was something of an octopus. He”s on record as saying he worked from the shoulder with a sort of whiplash action which didn”t put too much strain on his wrists. But he did own up to being physically tired after a show and needing a long, long time to unwind. However, while he was playing he transcended the physical side. He”d try to involve himself entirely with the music so that then the drums would become part of it. He admitted to a talent to function physically while his consciousness was elsewhere, and it seems he applied this philosophy to his life as well as his drumming. It”s no surprise that he was adamant that the drummer should be aware of what the rest of the band was doing. didn”t matter. He seemed to make up his own combinations of beats. He really didn”t care which hand he finished on so long as it was near a cymbal he could hit for the downbeat after a fill. Buddy Rich also claimed that cavalier sort of attitude to the learning of rudiments, but you could never be sure that he meant it since he appeared to play them all the time. Moonie was a natural and never particular about which way a fill round the toms went. He didn”t care if he finished up on his smallest tom or his largest, just so long as he was in time. Tony Williams once described his playing as beautiful and totally free. Equipment-wise Keith was involved heavily with Premier for most of his professional career and in the enviable position of being able to persuade them to make things especially for him. The company never actually made a 15″ tom tom during his day but they did one just for him. Perhaps his best remembered kit consisted of a pair of 22″ single-headed bass drums, with 12, 13, 14 and 16″ double-headed toms mounted on the bass drums. In front of these were single headed toms measuring 12, 13, 14, 15 and 16″. To his right he some times had four floor toms (18s and 16s) and also a hi-hat in the half-open position (there are photos with a floor tom on the left of this set too). He also had a pair of timbales and a couple of tympani, and, towards the end, a couple of gongs. Sometimes he used the 5″ wooden Gretsch snare drum, but from time to time you”d see him with a Premier metal shell or perhaps a Ludwig 400. He did make the odd excursion into the world of American drums. 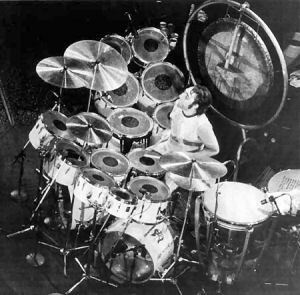 At one time he had a Zickos, a four drum Ludwig `Super Classic” kit with a `400” snare drum, as well as a double bass drum set up with a pair of 13″ mounted toms and a couple of 16 x 16″ floor toms (one on his left, the other on his right). His choice of cymbals was sort of bizarre too. For years the counter point to his half-open locked hi-hat was a 20″ crash/ride which gave him the opportunity to really build on a full ride sound, more or less in the same way Ringo had with the Beatles. His hi-hats were 15”s while the rest of his set were 18”s, 20”s and 22”s invariably with a 14″ splash. 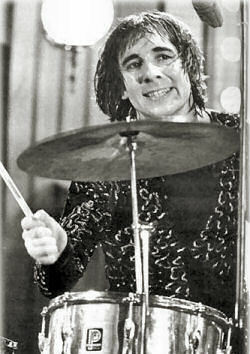 Mostly these cymbals were Zildjians, but from time to time he played Paiste too. I remember reading an interview with Barrymore Barlowe some years ago where he alleged that he and Moonie were neck and neck as to who had broken the most cymbals. This is not to denigrate any particular company”s products; Moonie was nothing if not fair – he”d break it, whoever manufactured it! I suppose he had a lot of cymbals on his set for the time, but with the advent of the sounds and cymbals which companies are producing now, he”d have been in his element today. 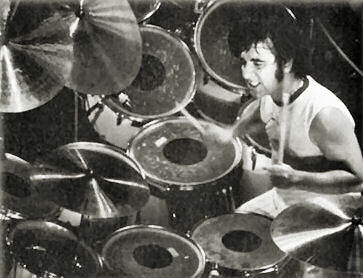 He could have had a whole battery of Chinese cymbals and as many different sized hi-hats as he could fit into his set. What would he have made of a remote hi-hat pedal, or a drum rack, or power toms? 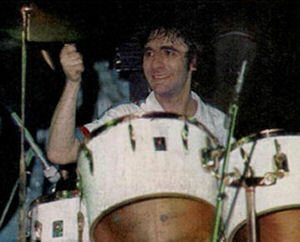 This is a somewhat controversial topic (and one which I have been criticised for bringing up before), but just before he died, Moonie was thinking of playing a different set of British drums and move away from Premier. 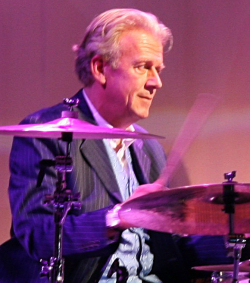 Staccato drums were the brain child of Pat Townsend and Chris Slade – a drummer who worked for Tom Jones, Manfred Mann, AC/DC and eventually Jimmy Page”s `Firm”. The drums were made from fibreglass and were horn-loaded with a sort of trumpet end coming from their bottoms and at right angles to their heads; rather like the North drums built during the 70’s in America. The difference was they had a unique `manta-ray” shape at their open ends. The bass drum had twin horns and was often referred to as `Elephant”s trousers” since that as what they looked like. Can you imagine Moon on these? Anyway, the Staccato company had changed hands and was no longer owned by Chris Slade and it was the new people who tried to forge a deal with Mooney. Unfortunately Keith died from an accidental overdose of drugs which were prescribed to ease the pain of alcoholic withdrawal and that was that. I”d liked to have heard him playing Staccato since not only were they the loudest drums I”ve ever found, they were also the most bizarre looking. 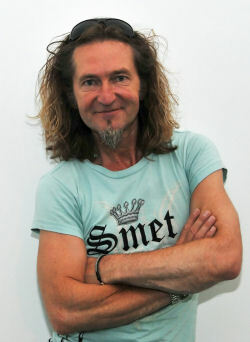 In short, a perfect combination for `The Wild Man of Rock”. Around this time he used to come to my drum shop in London”s Wardour Street every Friday. He”d park the white Rolls outside and we”d sit in the back drinking a little (make that a lot) of medicinal brandy and listening to tapes of the Who. We discussed an idea I had for him to get Premier to put snares on all his drums, including the bass drum. Moonie was into it and I always felt it was a great plan. He was the only drummer I could think of who could have possibly carried it off so the idea died with him. Can you imagine it, snappy sounds on every single one of his drums? 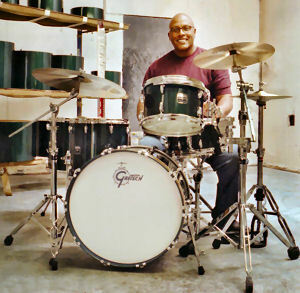 One day he arrived at the `Drumstore” with his huge boot full of snare drums which he wanted to sell. He”d been cleaning out a room, he said, and discovered all these drums. Did we want them? If ever a drummer would have benefited from new technology it would have been Moonie. Can you imagine what he would have made of the millions of digital sounds and sequences which could have been at his (or should I say some technicians) fingertips courtesy of the magic of MIDI? It”s a shame he never got to see it. I’m not sure how he would have coped with the technology though because he didn”t seem to be very good with machinery. I”m sure everybody”s aware of the car in the swimming pool and the hovercraft in the lake stories, (from which he had to be rescued by the police), and the trees in the garden of his Chertsey home presumably still bear witness to this singular lack of ability with machinery. 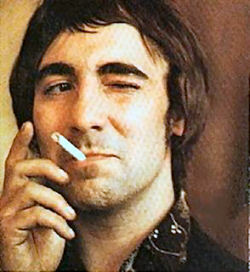 Negotiations were well under way between Keith and I for me to write the official Keith Moon biography when he accidentally shuffled off this mortal coil on the morning of September 7th 1978. It”s a shame the book didn”t happen because I”m sure that once again, neither he, nor I, would have let the truth stand in the way of a good story. I can”t believe it”s been 30 years.